*Actual On Road Price of Yamaha YZF R1 at the dealership may vary. The R1 is underpinned by a diamond design aluminium frame and comes with an inline four, 998cc petrol engine. The YFZR1 gets telescopic forks in front and double swing arm for the rear. Given that the engine produces 197.3bhp and 112.4Nm of torque, Yamaha has fitted the front wheels with 320mm dual discs while the rear has been given a 220mm single disc. Features that are standard on the YFZR1 include a slipper clutch, adjustable foot rest, projector headlights and an electronic instrument gauge with dual trip metre as well as an analogue tachometer. This is a magnificent superbike loaded with ultra modern technology. That blue colour is really mind-blowing. In spite of having so much performance, this bike, I think delivers a decent fuel economy. Yamaha company is known for their quality service network. All Yamaha bikes are also reliable and well built and solid motorbikes. 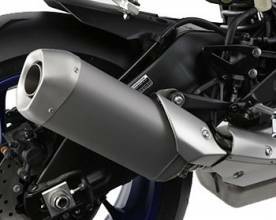 With 100 percent confidence, I believe, even YZF R1 also has the above mentioned qualities. This is a bike which I dream of owning in the distant future if I become a rich man.